This week I’m going to cover one of those deceptively simple cocktails. The Amaretto Sour only has two ingredients, Amaretto and Lemon Juice and yet it is so often executed poorly. I guarantee if you’ve ordered an Amaretto Sour out somewhere you’ve been served a poorly prepared drink. Why? Sour mix. The classic recipes call for lemon juice and I assure you the drink was created with fresh lemon juice in mind. When you use sour mix you get a sweeter drink than you will with fresh juice which, in turn, throws off the balance of the drink. So, on that note I’ll leave you with this example of how not to make the drink followed by a recipe on how to make it. This was another cocktail that really impressed me. Looking at the ingredients I was a bit skeptical to begin with. I mean you’re intentionally combining lemon juice and cream and expecting the result to be good. That’s just not something that usually fits in my world view. Well, I should say my previous world view. You see, the Ramos Gin Fizz is fantastic. The flavor is very unique with the lemon and gin flavors combining surprisingly well with the richness of the cream. The egg white adds really nice mouth feel and foam that is flavorful and tasty unto itself. This cocktail would really be a great addition to a brunch menu which isn’t really something new. That’s one of the suggested applications by a number of folks. One of the interesting things I noted as I mixed this cocktail for the first time is that the foam is indistinguishable from the liquid portion of the drink. It really creates a very unique look for the cocktail. So, what advice can I offer as you go to mix one of these for yourself? Well, first, make sure you use plenty of ice. The first one I mixed I only used 4 cubes of ice. The drink never got as cold as I would like as was evidenced by the lack of frost on my shaker. In addition there was a lot more melt than I would like. From that point on I used as much ice as I could reasonably fit, about 6 cubes in my case. Next, make sure you either combine your ingredients very quickly or, if you’re slow like me, put the cream and egg white in one half and everything else in the other until you’re ready to shake. If you don’t do this you run the risk of having your cream curdle. Certainly not optimal. I tried a couple other recipes, both nearly identical to the Joy of Mixology recipe with one twist, an increase in the simple syrup to one full ounce. I found the resulting cocktail was too sweet with that much sugar and stuck with the 1/2 ounce as my standard. I never did get around to trying the blender option for creating the foam but also found I didn’t really need it. I didn’t even end up needing to do a dry shake. I simply loaded up with ice and shook for 1-2 minutes and got a wonderful foamy result. What shaking for 15 minutes will get you I can’t say. But then again, I don’t have a line of shaker boys to supplement my tired arms. Finally, the choice of gin for this cocktail can run the board. 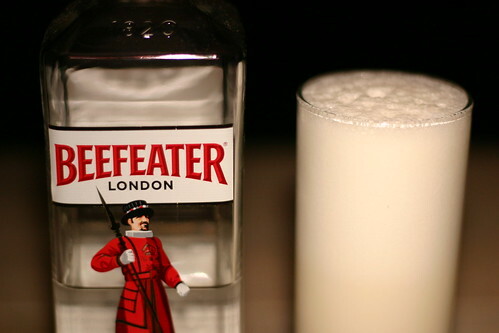 As I mentioned in my review I used Beefeater all week and it worked wonderfully. However, if you’re looking for something with a bit less juniper hit try a more citrus forward gin like Bombay Sapphire. Lastly you’re certainly welcome to try a very juniper heavy gin in this (eg Tanqueray), however, I think the citrus notes blend really well with the lemon juice and are thus your best choice. I’m back in action and ready to take on a new cocktail! This week I’m going to cover another drink that’s been on my Todo list for a long time but, for lack of a better word, I’ve been avoiding it. 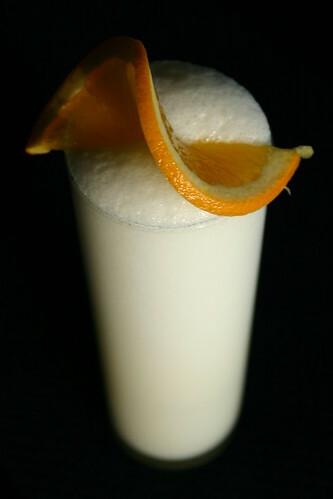 The cocktail in question is the Ramos Gin Fizz. My inspiration for finally tackling this classic watching Marvin at the Carousel Bar carefully craft them during Tales of the Cocktail. Each one, although time consuming was carefully prepared. 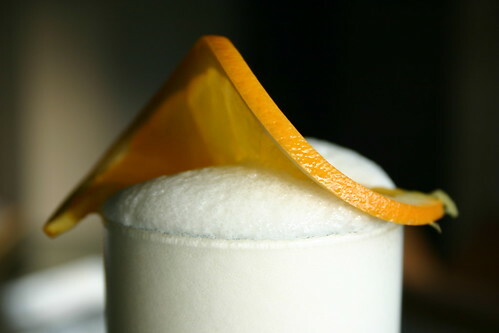 Invented by Harry Ramos at the bar in Meyer’s Restaurant in New Orleans, LA in 1888 the Ramos Gin Fizz is a bit time consuming. Originally this drink called for 10-12 minutes of shaking to reach the consistency necessary. Generally they would accomplish this by handing the shaker off from one person to another. Now you can see why I was a bit leery to feature this one. However, that being said there are rumors you can achieve the same effect using less ice and a blender. So, my arms may survive the experience afterall. To get your Ramos Gin Fizz experience started take a look at another great video featuring Chris McMillian. Well, we’re back from Tales of the Cocktail 2009 at least physically. Mentally, not so much. As I sat at work today I kept half expecting someone to come up with a cocktail sample for me. Seems my sense of reality has been a bit warped by the whole experience. All towards the good though, I assure you. I’m not going to be featuring a cocktail this week. However, I’ll be posting an article on the official Tales of the Cocktail blog later in the week giving some impressions from a first time attendee. I’ll post a quick note here when it’s up if you’re interested. Check back next week for a return to regularly scheduled programming.